Pours a big two finger head into my tulip glass. Maybe just a hair off white. The body is orange, somewhat dark for a lager. Visibility is quite high. Medium amount of bubbles coming up. Head retention is good so far. Looks good. The nose is a little sweeter than usual, it has to get the sugar for 7% from somewhere though. Caramel. Slightly metallicy. Some piney hops are present, mostly kinda an astringent hop aroma, pretty strait forward. My nose is a little stuffy, but this only smells ok. A little on the sweet side, and while it's present, there is not a very detailed hop aroma. Yeah, this is a pretty flavorless hop profile, bitterness is noticeable, but not much flavor contribution. Not quite as sweet as I was expecting, but it's also not that refreshing or crisp. Very wet mouthfeel though. Perhaps I'm used to drinking euro lagers, so the style is not my things right now. But then again, Six Point doesn't specify a lot of their beer categories, so who knows if this is really an American Lager, as it says in BA. Overall the flavor is quite watery and flavorless. You even get more sweetness out of a macro lager. Hop bitterness is nice, but dang, no flavor. As mentioned, the mouthfeel is pretty wet. Also, extremely watery and characterless. The carbonation is there, and about medium. With a noticeable bitterness. But nothing is making the beer feel like it's even sitting in my mouth, not even the carbonation. I know it's a lager, but this is too thin and vanilla for me. The drinkability is high, but it's not because it's terribly delicious. The appearance turned out quite nice. I got solid lacing out of a glass that usually yields very little. The head retention was above average as well. Good looking beer. Overall there is nothing bad about this beer, it's not off putting, it's just really missing in the flavor category. Overall, it's ok.
Kinda reminds me of a Boston Lager but with more flavor, a better and more full-bodied mouthfeel, but without that tangy bitterness that the SA has (IMO). The rustic orange colored liquid pours out a nice foam topping that laces well down the glass. The taste is hop-forward, again, without being overly bitter. I really enjoyed this as a lager - not so light but not a variation to an IPA either. 12 oz can, wine glass, canned 15 October 2017. I misread the best by on the bottom as the canned date. Whoops! Poured hard, it builds a huge head and looks in all ways like an IPA. Slightly hazy orange, check. Tan-ish, large, and well retained head. Check, check, and check! Citric, hoppy, much like the Two Hearted past the best by date I recently had. I’m not going to knock it, really, based on my mistake buying it. A little caramel, but really quite benign, like the IPA from the brewpub that doesn’t get it. Taste follows in the same well worn lane of tasting like a pale ale variant. Now in the feel, I bet you could have fooled me into thinking this was an IPA when it was fresh. It is t remotely lager-like; a bit syrupy, dragging at the bubbles. Man, this really wasn’t what I was expecting for reasons preconceived and resulting from my mistake. I’ve tried to be fair, but it fits in the American IPA category more than any lager style. Appearance – One and a half finger head on a clear deep yellow body. Aroma – Floral, spruce, and a little bit herbal. Surprising from a lager. Taste – Pine hops and a little wheat malt. A bit more bitter than the style would suggest, followed the nose. Mouthfeel – Good, not too heavy. Overall – As someone who prefers ales, this was a pretty good lager and I would have it again. Slightly dark clear gold in color with minimal head yet foamy and spidery lacing. Hops and malt are the main players in the aroma. Taste says lager but it is set apart by a nice bittery and clean hop taste. Finish Is crisp and a slight bitterness lingers. Not a lager fan but will rate this to style to be fair. First try on a hoppy lager like this. Nice malt start with big hops flavor. Very drinkable and different from the IPA flavor. nice, well made but perhaps I am so used to top fermentation that I just prefer ales these days. Pours a 9 on the SRM chart. Sticky globs of creamy head.. Smells like pine, lemon, soft hot pretzel,Taste is unusual for a typical lager. Zesty,piney, nice caramel malt, lemon finish. This is a lager with a personality complex. It wants to be an ale but was raised as a lager. Feels crisp refreshing,nice caramel and lemon taste. A semi dry finish like a typical lager. I read some of the other reviews and I don't get some of them. I think this is a unique solid example. Golden-light amber appearance-->copper like. A huge drift of snow white head. Pretty cakey with chunky lacing. Lemon, tea. Sharp alcohol grain; rubbing alcohol on long inhales. Crisp. Med. amount of smooth, super-fine carbonation. Herbal hops, piney, grapefruit. Biscuity dough malt. I don't get that astringent alcohol sensation here although it's reminiscent of juniper, lime and gin. A: The beer is slightly hazy amber yellow in color and has a moderate amount of visible carbonation. It poured with a half finger high bright white head that died down but left a short head covering the surface, a narrow collar around the edge, and lots of lacy rings of bubbles around the sides of the glass. S: Moderate aromas of herbal hops are present in the nose along with notes of citrus. 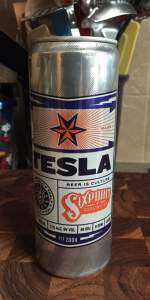 T: The taste follows the smell, except that the herbal hops flavors are a little less prominent and there are also hints of wheat and alcohol, the latter of which is noticeable towards the finish. M: It feels a bit shy of being medium-bodied on the palate and is crisp with a moderate amount of carbonation. There are also some hints of chewiness from the wheat. O: It's very hard to identify this beer as being a lager with all of the hops. It tastes like an IPA or an Imperial IPA.